KNOX, a key partner in improving the city of Hartford since its founding in 1966, was one of only 88 non-profit organizations in the United States to be selected as a first-ever AARP Community Challenge recipient. The grant program is part of AARP’s nationwide Livable Communities initiative that aims to create change and improve quality of life in communities across the nation for people of all ages. 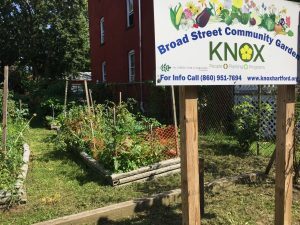 With the funding, KNOX is rebuilding Broad Street Community Garden’s 22 raised garden beds to make them more accessible for children, the handicapped, and the elderly. KNOX is also repairing a fence, installing a picnic bench, and adding a shaded umbrella area for gardeners and visitors to rest. The projects will enable the community to actively participate in making Hartford a more livable community. In addition, it will reestablish enthusiasm for gardening at this site, increasing the many benefits it provides to community gardeners and the families they touch. KNOX’s community gardening program directly provides healthy, affordable food for the residents of Hartford. KNOX manages and maintains 20 community gardens, providing over 400 families with local, affordable, pesticide-free food while building environmental responsibility and community self-reliance. The high-quality foods from these gardens are a much-needed source of nutrition for the city’s low-income families. Many Hartford residents suffer from food insecurity, often going for long periods of time without adequate, nutritious food. KNOX’s community gardens resolve their hunger long-term by enabling them to grow healthy food they can afford. As a multigenerational garden, Broad Street Community Garden enables children, parents, and grandparents to garden alongside one another. Three generations of families gather in this green space and will benefit from these much-needed renovations. Broad Street Community Garden is proof that community gardening is about more than just gardening; it brings people together, creating lasting friendships while providing families with healthy food they can afford. With limited transportation options and corner stores on every block, many Hartford residents are forced into unhealthy eating and living situations. KNOX’s community gardens give residents the ability to grow their own food locally – an opportunity seldom seen in many cities. By caring for a plot in one of KNOX’s community gardens, residents learn how to grow their own fruits and vegetables. KNOX staff provide both new and experienced gardeners with helpful advice and free workshops that inform them about organic growing techniques. Residents notice the difference in taste and quality between the food they buy at corner stores and the produce from the gardens. These green spaces not only touch the lives of their many gardeners; they also inspire many neighborhood and visiting youth to eat locally-grown foods through educational programming and casual visits. Witnessing the abundance of fresh produce in these gardens enhances community self-reliance and empowers individuals of all ages to lead healthy, sustainable lives. Residents gather in these green spaces around a common interest, connected to a diverse community that shares their goals. Many of KNOX’s community gardeners donate their produce to local food shelters, alleviating hunger for some of Hartford’s poorest residents. KNOX’s community gardens are about more than just gardening; they bring people together, creating lasting friendships while providing families with healthy, affordable food. Already KNOX has transformed many of Hartford’s empty lots into productive gardens that feed the city’s low-income families. For instance, once a vacant lot popular with drug dealers, Broad Street Community Garden is now a safe haven for children, parents, and grandparents to garden alongside one another. For a complete list of the winners and projects, visit aarp.org/CommunityChallenge.